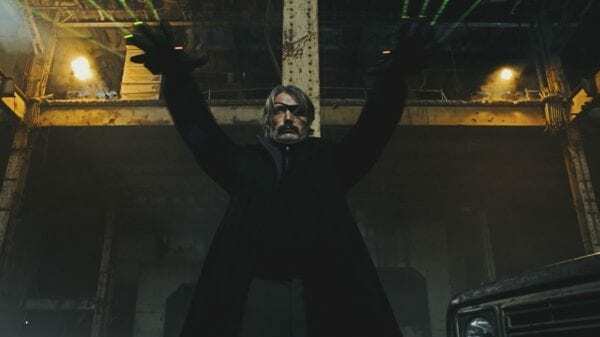 As appealing as a John Wick-esque action-thriller starring Mads Mikkelsen in the vengeful assassin role might seem on paper, this sketchy adaptation of Víctor Santos’ 2012 webcomic fatally overestimates its own charm and creativity, resulting in a loud and energetic yet mostly empty movie. Duncan Vizla (Mikkelsen) is a legendary trigger-man approaching the age of 50, at which point his employer, the Damocles Agency, will force him into retirement. But with Damocles’ head honcho Mr. Blut (Matt Lucas) set to pay out a princely, multi-million dollar pension to Vizla, he decides to charge him with one final assassination mission, one which Blut hopes will get Vizla killed and funnel that money directly back to Damocles. It’s a simple enough premise for a movie that’s not terribly concerned with plot or dialogue – rather appropriately, Santos’ original source material was wordless – but even embraced as a shallow, high-calorie, low-yield genre romp, Polar is more sickly and tiresome than charmingly bonkers. Director Jonas Åkerlund (Spun, Lords of Chaos) is clearly trying to evoke the same heightened, deceptively clever style and tone of Neveldine/Taylor’s Crank movies – and with the absence of a third Crank, there’s certainly an appetite for that – but without the duo’s sly stylistic brio or good taste in bad taste, this mostly comes off as desperately, self-consciously edgy. There will surely be those for which Polar‘s unfussed framing, wildly over-saturated colour scheme and laughably poor visual effects account for a fun time – a chest-thumping stand against cinematic convention that doubles down on every ugly thing its many detractors will despise. 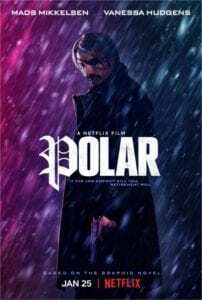 But it is a film that frustrates precisely because with a script that actually did justice to its workable premise, Polar could have been all of the above things and still a good movie. Yet the script, penned on spec by Jayson Rothwell, is shockingly dull and as such leaves Åkerlund and his cast mostly stranded to try and make the basic best of it. 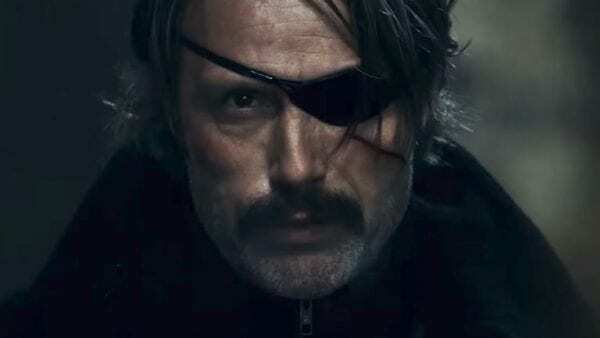 Though Mikkelsen’s involvement seems utterly baffling in retrospect, he does at least hurl himself into the part, his po-faced performance serving as a dramatic ballast when the film otherwise dares to get too silly for its own good. Plus, Mikkelsen allows himself to be put through several undignified scenarios during the film, not least a naked shootout after an attempt is made on his life during a vigorous sexual escapade. Ultimately, though, even an actor as talented as he can only do so much, and in both the dramatic and action stakes, there’s just precious little here for him to work with. While his pairing with Vanessa Hudgens – who plays his mysterious neighbour, Camille – does make for a few solid dramatic exchanges, it’s in the service of a film that can’t even get a firm handle on basic genre cliches, let alone anything slightly more ambitious. Elsewhere the cast is rounded out by a bleating, arguably miscast Matt Lucas in the role of Vizla’s boss Mr. Blut, while Katheryn Winnick is functional eye candy but given little to do beyond playing the attractive dame foil. Richard Dreyfuss later shows up for a brief moment in a performance that has to be seen to be believed, as an over-the-hill assassin associate of Vizla who now appears to spend his days getting sauced and singing karaoke. There are a few interspersed moments where Polar finds the smart-stupid groove it’s desperately grasping for, but they’re mostly just proof that, with a stronger script and more discerning director, there was some sure potential here. Instead, the film encumbers itself with attention-seeking yet paradoxically forgettable writing and potential-filled action sequences derailed by shambolic editing and aggressively flat coverage. It’s tough to fault Mikkelsen’s inexplicable commitment to the part, but the frantic, scattershot Polar is the streaming equivalent of being force-fed a share size bag of Skittles.